It is 1941 and America teeters on the brink of war. Outgoing naval officer Ensign Jim Avery escorts British convoys across the North Atlantic in a brand-new destroyer, the USS Atwood. Back on shore, Boston Navy Yard secretary Mary Stirling does her work quietly and efficiently, happy to be out of the limelight. Yet, despite her reserved nature, she never could back down from a challenge. When evidence of sabotage on the Atwood is found, Jim and Mary must work together to uncover the culprit. A bewildering maze of suspects emerges, and Mary is dismayed to find that even someone close to her is under suspicion. With the increasing pressure, Jim and Mary find that many new challenges--and dangers--await them. Sarah Sundin takes readers to the tense months before the US entered WWII. 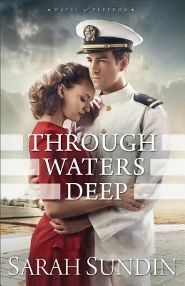 Readers will encounter German U-boats and torpedoes, along with the explosive power of true love, in this hopeful and romantic story. Purchase the book HERE. 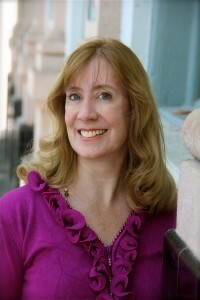 Sarah Sundin is the author of With Every Letter, On Distant Shores, In Perfect Time, and the Wings of Glory series. In 2014, On Distant Shores was a finalist for the Golden Scroll Awards from both AWSA and the Christian Authors Network. In 2011, Sarah received the Writer of the Year Award at the Mount Hermon Christian Writers Conference. A graduate of UC San Francisco School of Pharmacy, she works on call as a hospital pharmacist. During WWII, her grandfather served as a pharmacist's mate (medic) in the Navy and her great-uncle flew with the US Eighth Air Force in England. Sarah lives in California with her husband and three children. Visit www.sarahsundin.com for more information.